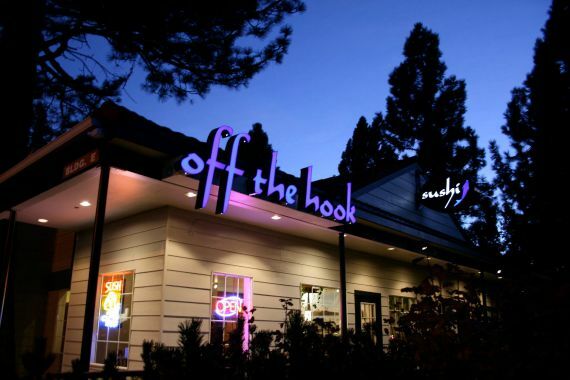 Off the Hook Sushi is the Lake Tahoe local's favorite spot for fresh sushi, sashimi, and a wide variety of unique California style rolls. "Using original recipes and the highest quality ingredients, our dishes are always made with our guests in mind." "Home is where the heart is, and ours is in South Lake Tahoe." "Can't wait to come back and eat your favorites? Our email list will hold you over until next time: https://bit.ly/2FR2dKc"
Great service and food. Will defindefin come again. Yes, I'd like to receive news from Off The Hook Sushi. Sign up for the Off The Hook Sushi Newsletter!